Hi everyone- I was able to change Orthopedic Surgeons. The new OS was sort of aloof. I dont think he felt comfortable taking me after someone else did the surgery. He looked at the surgery report and said he would not have used the kind of sutures that my previous OS used. He also knew my previous OS and said he was having personal problems. I feel for him but hope that did not impact the work he did on me. I am disapointed with Orthopedic Surgeons in general. But he did allow me to move to my boot and I am 3 days into my fourth week. So no more cast. He attempted to push my foot to 90 degrees or neutral and I was close to that but it was a real stretch, painful and scary. I showed him my boot and what it was capable of doing but he was really not interested. In fact he didnt put it on me or adjust it. He simply said work to get to 90 degrees which is the foot parallel to the ground or standing flat footed in the next two weeks. Dont do any weight bearing at all for two more weeks. He gave me a script for physical therapy which i start in two weeks. That will be 6 weeks out from surgery and then he left the room. One problem with the boot is that it has numbers for inflection and not degrees. So 0 is neutral or 90 degrees. Since i had been immobilized at what I supposed was -30 degrees I put myslef at 1.5 which is -15 degrees. I did this myself in the room after he had left. This was a bit demoralizinng but at least he took me on. I had the feelling that he did not want himslef or his staff to work with or put me in the boot for liability reasons. I just thought it was strange that he would leave the room and not attempt to get me set up in the boot. The major point is that I am in the boot. I have read that I should adjust the boot 5 degrees every 5 to 7 days. I may adjust more aggressively to get to neutral at 5 weeks since I should be there now. Does anyone have any thoughts on pushing to get to neutral in that time frame? Should I just force my foot into neutral right now strap the boot on and sleep with it that way? Also, I have read that some are full weight bearing at 4 weeks. That seems aggressive to me. This surgeion explicitly told me not to put weight at all on it for two more weeks. I should think that I can set my foot on the floor right now in the boot. I have and it feels fine to do that even though that is weight bearing. Anyway, interested in any thoughts on that. Also, i feel a hot stinging pain moving from the outside toe, across the outside edge of my foot, under my ankle and into my Achilles. This happens when i straighten out my leg. I have no idea what this is and didnt get a chance to ask the doc. Sounds like you switched from an angry Doc to one who’s unengaged, maybe bored. That’s lots not to be impressed by! I guess being treated like a God throughout your professional career takes its toll. . .
Tony, out of the frying pan into the fire so to speak. I’m a second timer, re-tore when I did too much to fast, mainly due to lack of direction and info, like your OS, mine too was busy and brief on visits. I too had to get the vacocast on my own. My doc wasn’t into the hinged boot but allowed me to work with it. Right now I would start out in as much plantar flex as you need to feel comfortable. Don’t get locked into time, go by how it feels. If it doesn’t feel right it probably isn’t My post surgical time, I went into a fixed boot 2 wks out from surgery. When they took me out of the cast and said to put the boot on I thought I was going to passout from the pain. I had asked the doc how much does it hurt, “its uncomfortable” nurse said the same. Well I was wheeled out to my car in a wheel chair. It took about 12 hrs to calm down and I could walk on it. I would imagine you will be similar. Ice a elevate today. Start with both feet on the ground sitting and see how it goes, don’t try to go past neutral anytime soon. While sitting you can unlock the plantar flex and do gentle ROM, pushing foot down it will help loosen scar tissue along ankle. Just remember slow is good. At 3 weeks I was weight bearing and 25 deg, 4 weeks full weight bearing and 15 deg, 5 weeks 0 deg 5 and a half weeks took off the wedge sole and went for the flat sole, and now at the end of week 6 I can walk around with a limp in shoes. I use the boot with full movement when I go out of the house. There were gradual steps in between that I have missed out. Along with the timetable for recovery provided with the boot I used the recovery stages & exercise in the link provided by Eric Berkson, MD (Orthopaedic Surgery of Quincy, Massachusetts General Hospital). 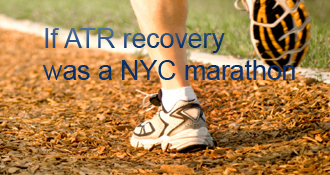 Top link in the ATR Rehab Protocols, Publications, Studies. The boot was the best decision I made, with out it I would be crazy and probably weeks or months behind in my recovery, Next week I go back to the surgeon, I’m not sure what he will say when I walk in. I haven’t been to a physio yet either. I must say a big thanks to everyone on this blog, especially normofthenorth I read a lot of your stuff. « Journey Begins with ?? ?